NASA will hold a teleconference today at 2 p.m. EDT (11 a.m. PDT/1800 GMT) update reporters and the public on the Curiosity rover's status. The Curiosity Mars rover team is expected to release new photos of the Martian surface during the briefing, which will be streamed live. 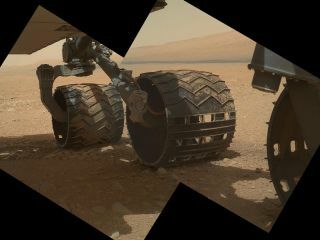 NASA's Mars rover Curiosity landed on the Red Planet on Aug. 5, beginning a two-year mission to explore its Gale Crater landing site. The rover is designed to study the Martian environment in unprecedented detail and investigate whether the region could have ever supported microbial life. The car-size rover is the largest, most capable rover ever sent to the Red Planet and has already snapped jaw-dropping photos of Mars, as well as of itself. NASA's Jet Propulsion Laboratory in Pasadena, Calif., is overseeing the $2.5 billion rover mission. Visit SPACE.com later today for complete coverage of the latest Curiosity rover press briefing.